Hagen Road Elementary school principal wants parents to tell kids they will be getting a "special snack" before the test that will boost brain power. The latest Florida Department of Education ranks Palm Beach County's Hagen Elementary School a "B" school. But teachers there want to improve performance on the Florida Comprehensive Assessment Test or FCAT and they are even willing to resort to a white lie, says the South Florida Sun Sentinel. 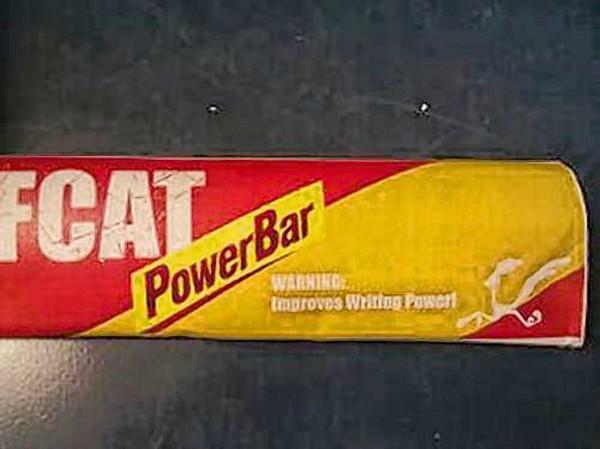 The principal of Hagen Road Elementary is telling parents to feed their children these "FCAT power bars." He sent them home and instructed parents to tell their kids that it would help them write better. Robert De Gennaro, a teacher and lead union representative, said he expects plenty of "dirty tricks" to be forced on teachers whose paychecks increasingly depend on student test scores. "If you were given a choice between your salary and hoodwinking kids, which would you choose?" he asked. Richard Hughes, principal of the school west of Boynton Beach, was not on campus Monday and could not be reached for comment. Hagen Road Elementary's placebo is an apple-flavored cereal bar, with the label: "Warning: Improves Writing Power!" So what are you or your kids' teachers doing to try to help them do better on the FCAT?